What is the ‘Spherical Revolution?” How is 360-degree imaging changing the game for Law Enforcement? L-Tron is honored to share that one of our team members, Hank Kula, was published in the July 2018 edition of LET Magazine. 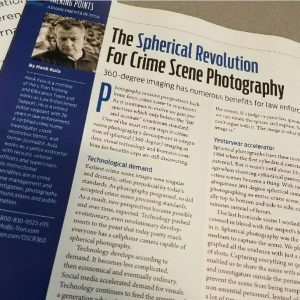 His piece, entitled “The Spherical Revolution for Crime Scene Photography” focused on forensic spherical imaging as an emerging technology for Law Enforcement. The piece focuses on the power of spherical imaging as a visual technology, and how it can help to tell a complete story. The article also touches on giving a voice to victims, and allowing witnesses to accurately share their perspective. L-Tron has recently launched OSCR360 – a new spherical imaging solution. OSCR360 allows investigators to gain depth, perspective, and a greater understanding of their case by providing a virtual crime scene walk through. More than just a camera, OSCR360 is a complete solution that allows you to organize, capture, present and preserve digital evidence files. OSCR360 was built from the voice of Law Enforcement and Prosecuting Attorneys. Thousands of hours have been spent collaborating to create features based off of your feedback. 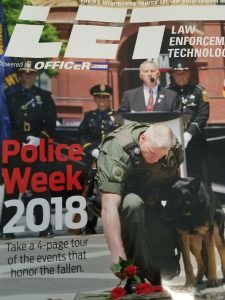 Law Enforcement Technology Magazine (LET) was created with the Law Enforcement Manager in mind. LET focuses on new, emerging trends and technology within the Law Enforcement field. Officers use LET to determine the new tools they might need for their department and why. 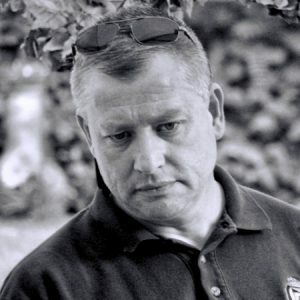 Hank Kula is a member of L-Tron’s Law Enforcement Support Team. He is a retired police Sergeant with 26 years in Law Enforcement. A certified crime scene investigator, crash reconstructionist and former journalist, Hank works as a police instructor with recruits, veteran officers, and supervisors. His instructional specialties include crime scene management, investigations, photography, communication and public information. Hank can make any of our L-Tron products look beautiful. When he’s not learning more about spherical imaging or looking angry, Hank enjoys spending time with his wife Nancy and their daughter.